Size of this PNG preview of this SVG file: 512 × 512 pixels. Other resolutions: 240 × 240 pixels | 480 × 480 pixels | 600 × 600 pixels | 768 × 768 pixels | 1,024 × 1,024 pixels. English: Azimuthal equidistant projection of estimated maximum range of some North Korean missiles based on data from http://ichef.bbci.co.uk/news/624/cpsprodpb/26F5/production/_88837990_north_korea_missile_ranges2_map624new.png . Deutsch: Geschätzte Reichweite nordkoreanischer Raketen auf Basis der folgenden Daten http://ichef.bbci.co.uk/news/624/cpsprodpb/26F5/production/_88837990_north_korea_missile_ranges2_map624new.png . This is a retouched picture, which means that it has been digitally altered from its original version. Modifications: Update ranges, reduce file size and "beautify". The original can be viewed here: North-korean-missile-ranges.svg. Modifications made by Cmglee. fields = (re.sub(r'([A-Z]+)', r'\1\t', re.sub(r'[\s,]+', '\t', pathd)). if (fields == '' or fields == ''): ## "Z"
current 17:25, 5 July 2017 512 × 512 (163 KB) Cmglee Update Hwasong/KN-14 range. 06:12, 11 May 2017 512 × 512 (162 KB) Cmglee Update ranges and map to azimuthal equidistant projection. 18:26, 4 April 2013 512 × 512 (688 KB) Cmglee Label Koreas. 12:52, 4 April 2013 512 × 512 (688 KB) Cmglee Add Guam and Hawaii. 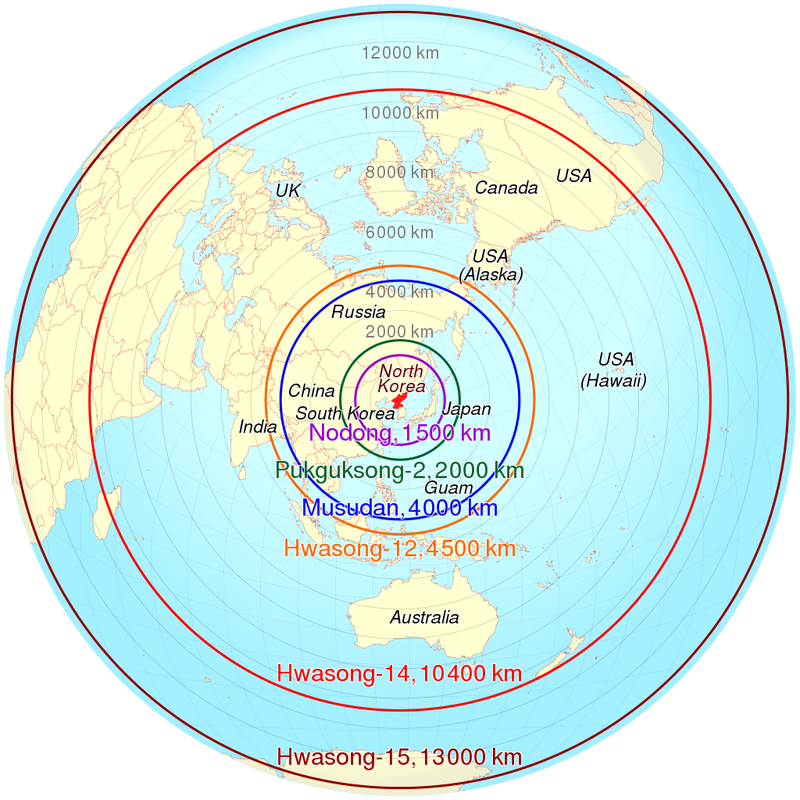 Azimuthal equidistant projection of estimated maximum range of some North Korean missiles, drawn by CMG Lee based on data from http://ichef.bbci.co.uk/news/624/cpsprodpb/26F5/production/_88837990_north_korea_missile_ranges2_map624new.png and http://ichef.bbci.co.uk/news/624/cpsprodpb/1592D/production/_95456388_missiles.png , and map from http://commons.wikimedia.org/wiki/File:North-korean-missile-ranges.svg .